Must I Purchase All the Books at Once? What Formats Are This Study Available In? Will I Receive Ordination Papers Upon Course Completion? Where Can I Submit an Order? The material furnished in this Bible Study was formulated and developed over a ten year period in an actual Bible school that held its classes at the Christ Unlimited Fellowship in Arizona. Pastor R.S. "Bud" Miller and his wife, Betty, taught these sessions and discipled their students by the leading of the Holy Spirit. Most of their graduating students are now in their own ministries in various capacities. Today they are serving God in their different ministries as these students are pastors, prophets, teachers, music ministers, youth ministers, intercessors, counselors, missionaries, and prison chaplains. This Bible Study is designed for those who have a call upon their lives for ministry or who have a desire to serve God, but have not had the opportunity to pursue a Christian education or training. Since the hour is late and the harvest is ripe, the Lord needs all who are willing to labor in His vineyard. If you feel a call or leading to serve God in a greater capacity, yet, feel unqualified or feel you cannot leave your responsibilities of family and/or job, this course is for you. The Overcoming Life Bible Study material will give you the major doctrinal truths to lay a strong spiritual foundation in your life so you can effectively share God's Word to others. You will have the knowledge of the Bible to be able to walk in the overcoming Christian life and then to help others do the same. We have condensed many hours of study into the meat of the Word of God so you will be able to complete this course as rapidly as possible. Since many cannot leave their responsibilities to go to Bible school, this course can be taken in the privacy of your own home, at your own pace. After completing this curriculum you will also have the books as reference material to use again and again as the need arises. It has numerous Bible verses to back up every subject that is taught. You will not need to quote a man's thoughts on the subject, but rather "What God's Word says about it." These courses are also great teaching aids that are very thorough and can be used for sermon topics, Sunday school material, care group teachings and of course, church Bible schools. The Overcoming Life Series is practical as well as spiritual, and when applied, the Christian who is committed to God can be an overcomer in his or her daily life. Many who have taken the course have testified that the knowledge gained from this Bible Study helped them walk in the overcoming life. The Bible says, "My people are destroyed for lack of knowledge---" (Hosea 4:6a). All of the problems we have can be overcome through understanding and applying the Word of God. Our prayer is that the Overcoming Life Bible Study will challenge and change your life. In turn, we believe that God will use you to change others! May you be richly blessed in your desire to show yourself to God as a "workman who needeth not to be ashamed, rightly dividing the word of truth" (2 Timothy 2:15). 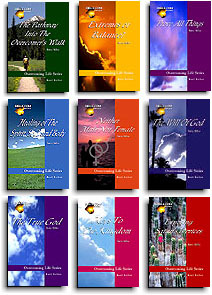 The Overcoming Life Series is a series of nine books and workbooks, which can be taken chronologically, starting with "Prove All Things" and continued all the way through to the last book, "Pathway To The Overcomer's Walk." The titles of the books in the study are: "Prove All Things," "The True God," "The Will of God," "Keys To The Kingdom," "Exposing Satan's Devices," Healing of the Spirit, Soul and Body," "Neither Male Nor Female," "Extremes or Balance," and "Pathway Into the Overcomer's Walk." This Study is designed so that you can work at your own pace. It comes complete with the answers in the back of the workbooks, so you can grade yourself. Please note that this is NOT a correspondence course.You will be responsible for your own progress. We do not grade the books for you, nor do we offer an ordination upon completion of the course. (However, we will send out a certificate upon completion of the entire course, if desired). This is a good study aide, even for those who are already in seminary as it has so many scriptural references for all topics covered. If you feel called into ministry or would simply like to enrich your understanding of Christianity in practical everyday life, this study will put a solid base under you and will equip you for ministry right where you are. No. The titles may be ordered as a set or purchased individually, with or without the workbooks. For example, if there is only one title in particular that interests you, you may order it all by itself. We do recommend ordering the workbooks with each book, though. The workbooks contain valuable additional information that is not included in the books, and will greatly enhance your understanding of the subject. If you would prefer to order one title at a time, that is entirely your own option. However, to properly complete this course you will need all of the books and workbooks. 1. It is available in 18 paper-back books and workbooks. This is the traditional study method, and remains one of our most popular formats for this study. 2. It is also available on two computer disks, which can be read by downloading the free Acrobat Reader software from the Internet. The disks are available for either IBM or MacIntosh computers. 3. It is also available for download right now from our web site itself. 4. Coming soon! We are also currently working on producing each book/workbook set separately on individual diskettes in an electronic Neobook reader for beginner computer users. You may peruse an overview of the material and review a sample of this material taken from Prove All Things the first study in the Series. Both book and workbook samples are available. (REVIEW SAMPLES). You will not receive ordination papers or a degree; however, you will receive a course completion certificate. We believe ordination should come through your local church through the elders. This Study is designed so that you can work at your own pace. It comes complete with the answers in the back of the workbooks, so you can grade yourself. Please note that this is NOT a correspondence course. You are responsible to grade yourself with the answers given in the back of the workbooks. This study is designed to enhance your knowledge of scripture and is wonderful as a preparatory course for the ministry. It has also helped many who are already in ministry gain a better understanding of the scriptures and lay a foundation in Bible knowledge. This course is designed to help all Christians attain the knowledge needed to walk in the overcoming life. (2.) Prisoners and prison libraries. (4.) Ministers and Christian Workers in developing nations. (5.) Those on the mission field who are supported by churches or mission agencies. If you fall into one of these categories and would like to apply for a scholarship please send us an e-mail request for a scholarship application. You must have a computer to receive these materials as they are available only by download. Right here! Just click on your preference below and it will take you to our Chapel Bookstore. (Please note that the electronic versions of this study have been reduced to $50.00 in the format of your choice. You will also need a printer to print out your workbook studies).